I have to admit that I am lazy when it comes to creating test data before user trainings. Too much clicking for nothing. I’d rather stay overnight and prepare LSMW tool, eCATT tool or write some ABAP code that would either generate data or simply upload some Excel data then click it myself. This is what I’d do even if I have to add manually 3 test cases. Another good thing is that in the process of creating the tool you learn a lot about the system. The point is the following code is just to show you that sometimes ABAPing is better than all the other tools! And with BAPI_MATERIAL_SAVEDATA you can do it all at once and you have a better insight of what is happening than with LSMW (OK.. this is just my opinion). So let’s see what this code is all about. First check the FM through se37 -> BAPI_MATERIAL_SAVEDATA and see which tables/structures you need. If you don’t really understand which you should use consult Google or even better consult a senior and you will realize which of them you really need. HINT: Another starting point how you can discover which of the structures you need to use is to create manually one new material in the system and see which are obligatory fields while you create it and through the technical information find out the structure where they belong. So in an hour 0r two you will (like it or not) learn all the tables that make the material master data. IT_T001W TYPE TABLE OF T001W WITH HEADER LINE. 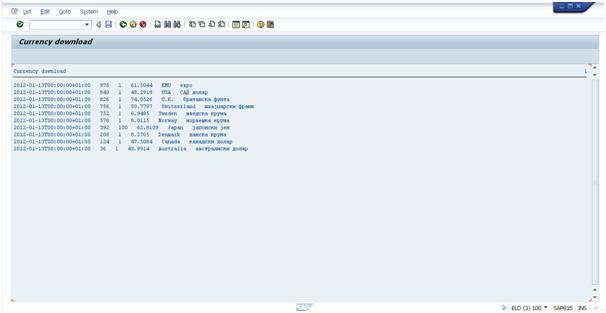 I am sure that by analyzing these lines of code you will learn many of the tables where the material master data is stored in SAP and the people there were nice enough to give them descriptive names in the BAPI so that you find your way out easily. Next step internal table that represents the migration structure and will be needed in the Excel file. IT_BAPI LIKE BAPI_MAKT OCCURS 0 WITH HEADER LINE. This table should be prepared so that it suits your needs (or your client’s needs). And following is the code for uploading the file in the table. AT SELECTION-SCREEN ON VALUE-REQUEST FOR p_file. CONCATENATE IT_T001L-LGORT(2) IT_T001L-LGORT+3(1) INTO ST_TYPE. CONCATENATE IT_T001W-WERKS(2) '00' INTO SLS_ORG. write: 'PLANT: ',IT_T001W-WERKS, ' STORAGE LOCATION: ', IT_T001L-LGORT, ' ',  RETURN-type , ' MESSAGE:', RETURN-MESSAGE, '/'. WAIT UP TO 2 SECONDS. I promise this 2012 I will write more often and I guess someone will find what they need in the posts. 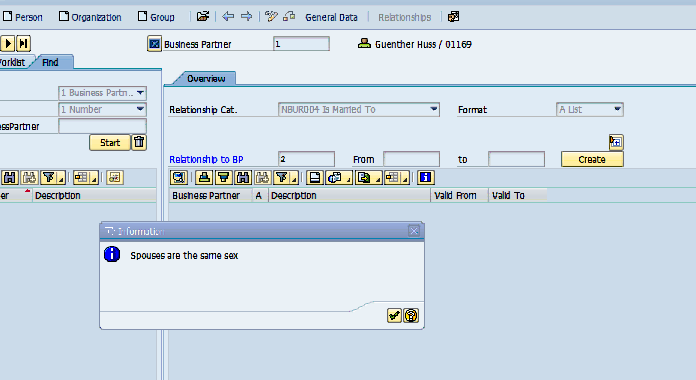 As a first 2012 post I chose to write something about SAP and web service acquisition. This is a really simple example with simple code but it can be further extended and improved in different cases. I would suppose that the reader is familiar with XML and XSLT (if not please check the following basic tutorials: W3Schools ) and has experience in any programming language and thus will easily “read” and understand the ABAP lines of code. Maybe he/she has also tried some web service acquisition in some other language but is an ABAP beginner and wants to get some job done really quickly. So.. we have some web-service from the National Bank of Republic of Macedonia– currency download – for getting the currency exchange rates on a given date. This is one of the main things that is implemented in any project since any company needs the exchange rates in many of the processes. Since I am not here to write about business processes I will stick to the technical details. Aha there is the definition: KursZbir is the element containing all the data about the exchange rate of the currency according the Macedonian denar. And that is the content we need to put in an ABAP table and do what is necessary with it. So before you think about which parsing technique should be used and all that I will tell you that the solution is just couple of clicks away. SAP is really sometimes nice to developers and sometimes it is better to search for a day or two first for some technique or a module instead of writing a bunch of code. You see here that the method is really simple and the result is just square root of the value sent. The problem is when there is a more complex structure like the one we have to deal with now. Now we have to make a transformation. 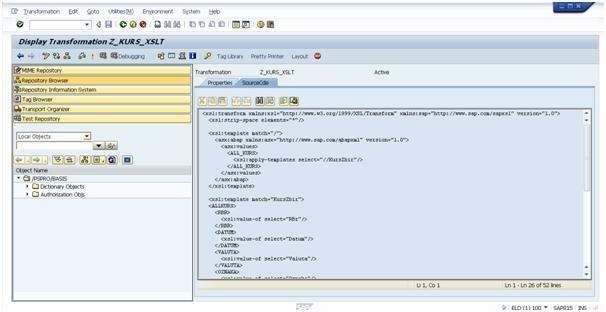 It is nothing too complicated just a way to tell one really great SAP function how to transform the “weird” XML data string into table data. It is done through the Object Navigator (SE80) . 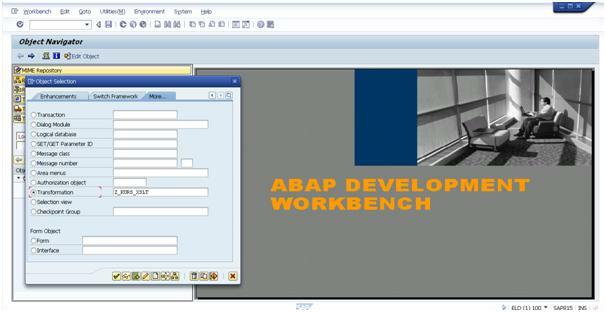 Open the menu: Workbench -> Edit Object. From the dialog select transformation and then create. Actually writing the transformation is the hard part. The ABAP code will actually be short and simple. DATA: proxy TYPE REF TO zkurstestco_kurs_soap . concatenate sy-datum+6(2) '.' sy-datum+4(2) '.' sy-datum(4) into cr_date. DATA itab TYPE kurszbir OCCURS 0. DATA lt_kurs TYPE TABLE OF kurszbir. DATA wa_kurs TYPE TABLE OF kurszbir WITH HEADER LINE. zinput-end_date = cr_date. "cr_date . REPLACE ALL OCCURRENCES OF '##' IN result WITH ' ' . wa_kurs-nomin, ' ', wa_kurs-sreden, ' ', wa_kurs-drzavaang, ' ',    wa_kurs-nazivmak, ' '. After that you can either schedule a job or set a transaction and the client can perform it on their own. Next time maybe something more about more complex XML structures.